I have two photos of a sunset. One is exposed for the reddish colors at the horizon, which fades into blues and blacks. 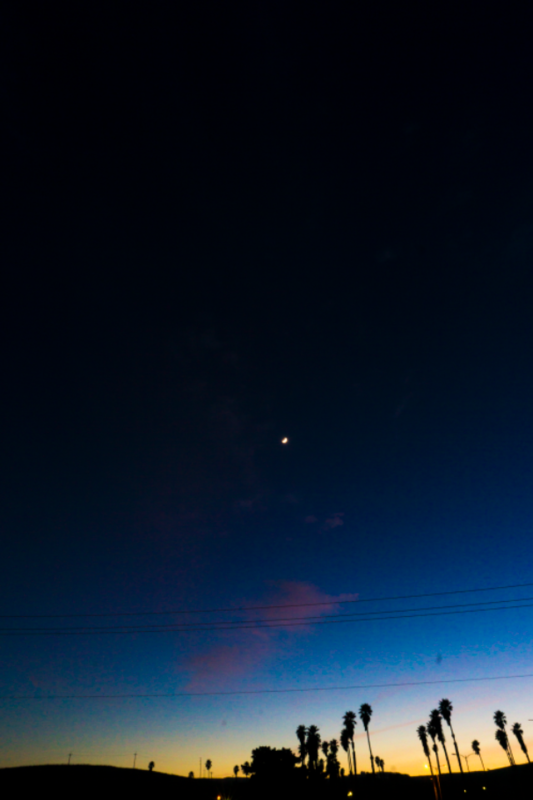 The other is overexposed and the bright part near the horizon is a boring white. I am trying to blend some of the interesting reds and blues near the horizon onto the overexposed horizon. The light oranges and reds of the sunset are bright, so they should appear most vividly on the result. The blues above that are darker, so they should appear less vividly. The blacks tones above that should not show up. For this effect, I would usually pick the Screen blending mode. But because the base layer is nearly white, the result of the blend remains white. 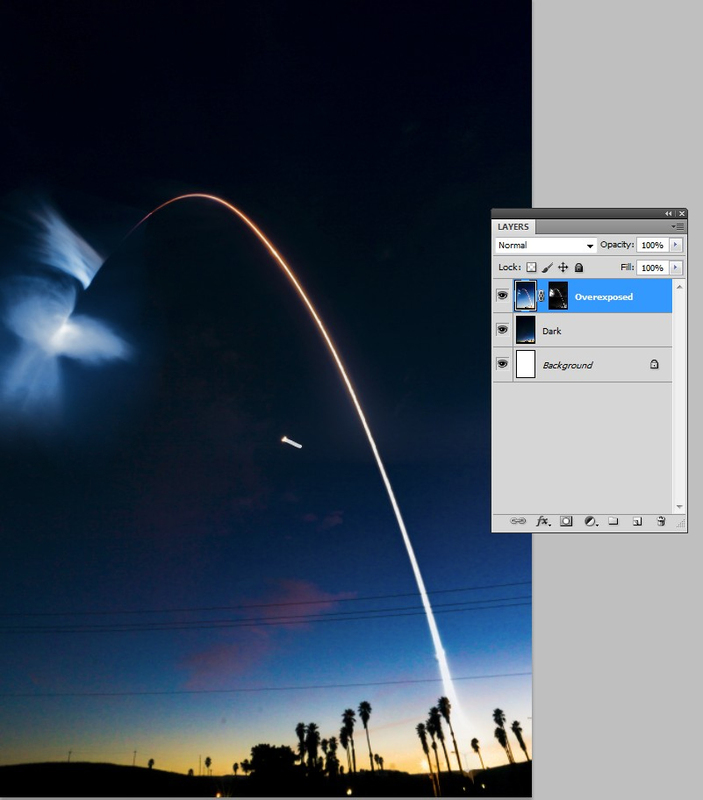 None of the layer blending modes in Photoshop seem to work in this situation. How can I achieve something like Screen which places color even on top of a white base layer? The bottom of the overexposed image is covered with a layer mask. 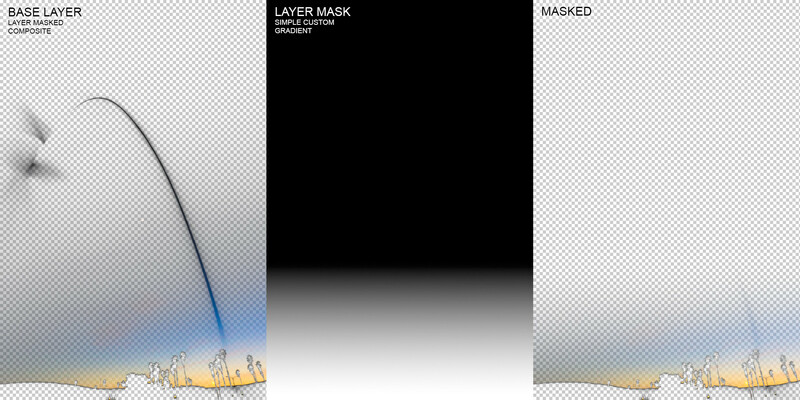 The mask was a BW gradient. 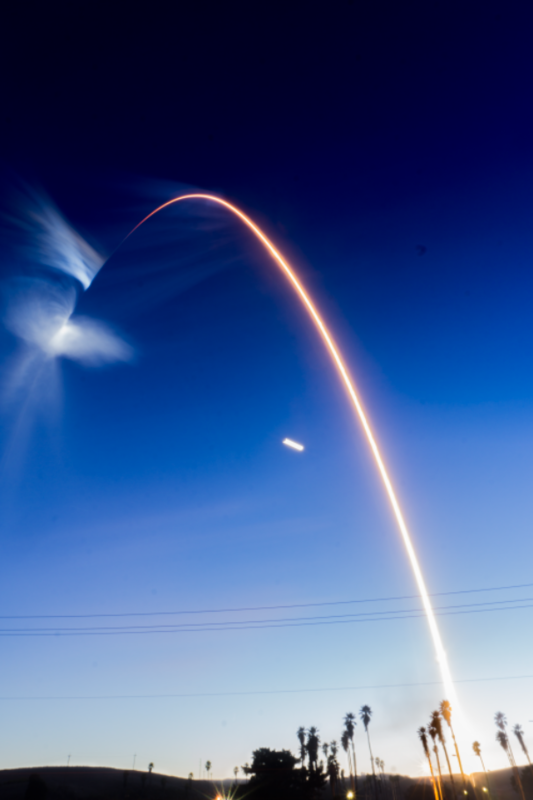 White was added manually to reveal more the rocket trace at the bottom. A soft brush was used and the handpainted mask was blurred. The overexposed has different blue. It was adjusted to the same as the blue in the dark version. Tinkering like this is very laborous if one vants to go into details. 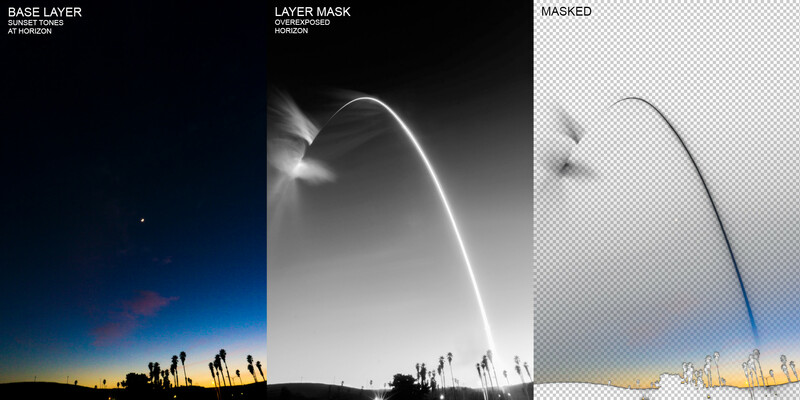 The next step would be to separate the rocket trace into a new masked layer and colorize it. Finally the whole bag would get more saturation and also midtone darkening. I skip the colorizing of the rocket trace, but add the saturation. After thatI darkened the midtones with the curves tool. NOTE: I flattened the image before adding saturation and darkening. The pro way is to not flatten, but add adjustment layers. 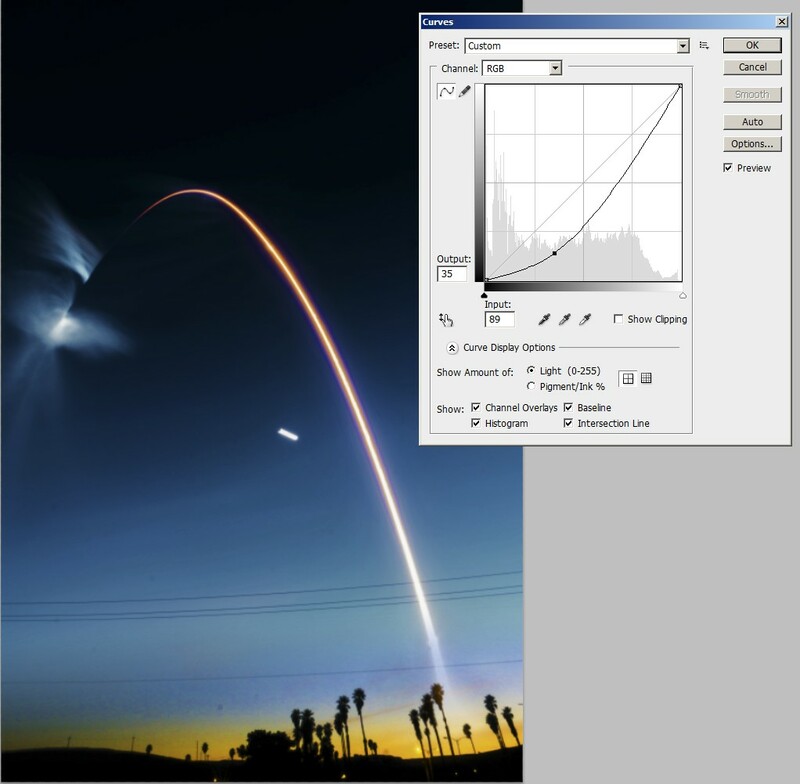 Only the rocket trace was picked from the overexposed image by adding a layer mask. It's handcrafted starting from the overexposed image itself. With curves tool the trace was nearly totally picked. The rest was painted with a brush. If you have a RAW image, you propably could get the colors well presented. Reduce global gamma and increase local contrast to retain details. To do it one must learn how to develop the RAWs. I usually take only RAWs to be able to dig the max amount of details. If I know I am in hurry, I take at the same shot both JPG and RAW. If I am lucky, the JPG is good as is, but that never happens when I shoot dark targets against bright lights without a fill light. Fill light is of course not possible, if distance is more than few meters. You can apply a mask on the picture exposed for the reddish colors and work with a light grey (soft) brush, at 5 -10 percent opacity. 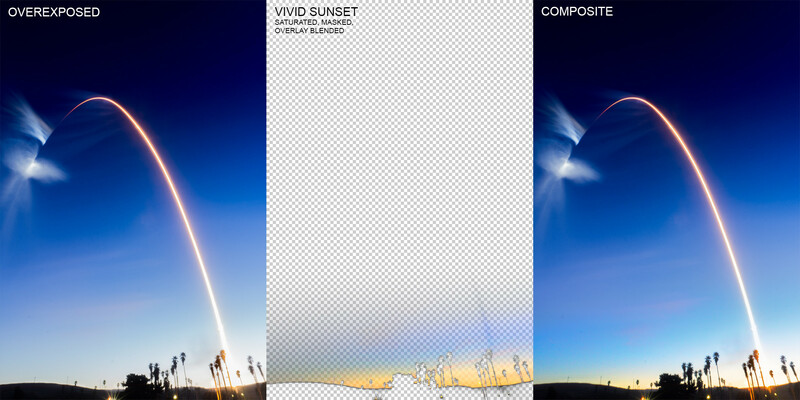 This should give you more control than a blending mode to reveal some details of the sunset on the overexposed picture. While the Screen blending mode makes it essentially not appear because it blends onto an already white background, Overlay allows some of the sunset tones to blend through, which can be enhanced by boosting the saturation. This makes the light areas of the sunset layer appear nicely vivid, but it has a negative effect on the darker parts. 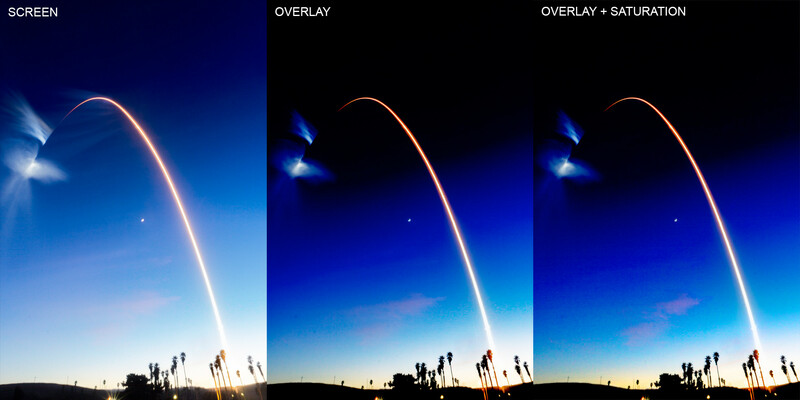 Instead, we want the sky from the overexposed layer to show through so the overall composite is not so harsh. This helps cut away the foreground palm trees and terrain and gives a gradient to the sky. It essentially constrains the sunset to where the sky is bright in the overexposed image. The darker regions, where the desired vivid sunset does not appear, get hidden and allows the overexposed frame's terrain and sky to show through. This masked result has an Overlay blending mode and a saturation adjustment layer exclusively applied to it for the reasons explained above. This preserves the exposure and details of the original rocket launch long exposure, but augments it with the attractive colors of the sunset captured beforehand with a shorter duration exposure. With some finishing touches (restoring the unstreaked moon from the short exposure, applying a black gradient to darken the upper sky, and some subtle color corrections), the composite is done! Not the answer you're looking for? 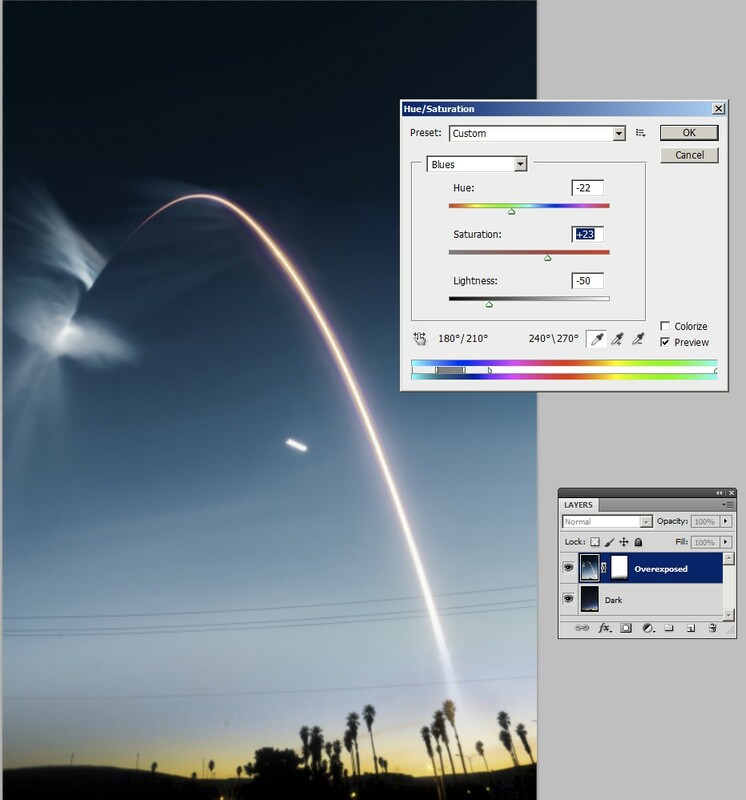 Browse other questions tagged adobe-photoshop photo-editing blend-modes or ask your own question. Blend only affecting specific base color? How can I achieve the dark tones in this photograph? How to eliminate the white highlights? How to match skin tones in Photoshop? Hierarchical layer blending in Inkscape?